Shazam (formerly Captain Marvel) is one of the oldest superheroes still in print. Put on the page less than two years after Superman’s debut in Action Comics #1, Shazam was already a pure distillation of the superhero dream — mainly, a kid in a cape that’s really a towel. The good-hearted orphan Billy Batson says a magic word and becomes an invulnerable adult, the mightiest hero on Earth. He gets this power from a wizard who lives in a cave. He gets to the cave on a magical subway car. These images have survived nearly 80 years intact. Trailers for Shazam! have not revealed much more than that origin story, leaving many — I think reasonably — puzzled by the movie’s plot and tone. Having seen it, I can reassure you that Shazam! is the mainstream-accessible, all-ages production that the Shazam of comics history has always deserved. David F. Sandberg, a genre director known for conjuring scares in Lights Out and Annabelle: Creation, delivers an outright joyful fantasy that doesn’t waste a moment on feeling self-conscious. Writers Henry Gayden and Darren Lemke do all the right work to etch a modern version of Billy onto the viewer’s heart. This version of Billy Batson (played by Asher Angel) takes after his recent comics counterpart: Instead of a homeless newsboy, he’s a streetwise kid bouncing from foster home to foster home, shrugging off any attempt to build a new family as he searches for his mother. Billy’s latest guardians are Victor and Rosa Vasquez (Cooper Andrews and Marta Milans), who are already raising a family of four other fosters: Mary (Grace Fulton), Eugene (Ian Chen), Darla (Faithe Herman), and Freddy Freeman (Jack Dylan Grazer), Billy’s soon-to-be-partner-in-crime. These characters — most of whom are ripped from the pages of DC Films producer Geoff Johns and Gary Frank’s 2011 Shazam! series — turn out to be an unexpected treat, instantly charming and almost never cloying. Littlest sister Darla in particular is a scene-stealer, and Freddy and Billy’s relationship forms one of the backbones of the film. 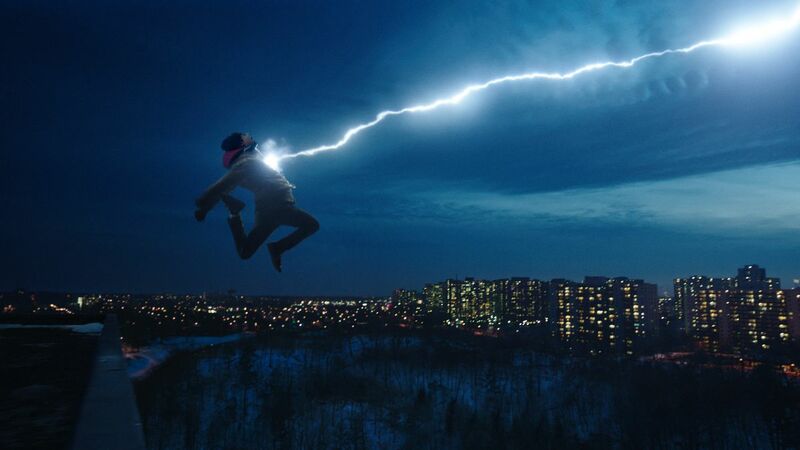 That connection also allows Sandberg to indulge in what are clearly his favorite sequences, the ones where Freddy and Billy explore the nature of Billy’s powers and the beginning of his “superhero work” as Shazam. And if you know anything about Shazam, you know he has a lot of powers, from strength, flight, and invulnerability to super speed and the ability to fire bolts of lightning from his hands. Freddy, the ultimate superhero stan, guides Billy through the discovery of his powers through accident and experiment, all the while filming the entire thing for their instantly popular YouTube channel. While in his red-clad, half-caped form — which is never explicitly given a superhero name that sticks — Billy is played by Zachary Levi, a role that the former Chuck star slips into seamlessly. It’s the rare case in which a costume that rounds an actor’s shoulders and arms to almost cartoonish contour enhances the character. Add in Levi’s frantic physicality and easy transitions from confidence to panic, and the illusion is complete: not an adult acting in the role of a child, but a kid trapped in an adult’s body. Most people draw a Tom-Hanks-in-Big comparison — even Shazam! itself can’t help but throw in a giant piano gag — but think more Helena Bonham Carter pretending to be Emma Watson pretending to be Hermione pretending to be Helena Bonham Carter pretending to be Bellatrix Lestrange, and then multiply it by an entire film. By the time Billy and Shazam!’s villain, Dr. Thaddeus Sivana (Mark Strong), actually meet, the film has spent so much time building out Billy, Freddy, and their siblings that Sivana’s character development is left somewhat out in the cold. He was denied the power he wants, so he gets some, then he comes after Billy’s as well. He doesn’t want that power for anything in particular; he just wants power. 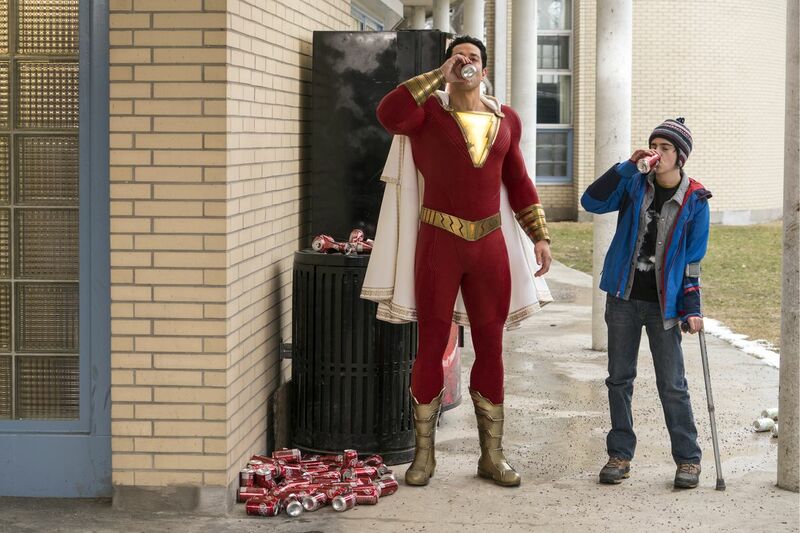 But it’s a necessary division of the audience’s attention, and worth it for Shazam!’s emotional payoff. The point at which Billy truly becomes a superhero, and not just a kid who can shoot lightning out of his hands, is when the prickly, wayward teen realizes he has something worth saving: a family. Cue the “awwwwws,” sure, but Shazam! doesn’t care if its themes are simple ones. It’s a big-hearted fantasy, and proud of it. And he might be a bit flat, but when an empowered Sivana suddenly drags our hero a mile into the sky, he still drags the stakes of the movie with him. In fact, while Shazam! is definitely aimed at a wide age range, there may be a couple of moments that are a bit scary for small kids. Perennial Shazam villains the Seven Deadly Sins are pretty gnarly under-the-bed-type monsters, and there are a few medium-sized jump scares early on. But if your kiddo can handle it, please, please, please bring them along. Shazam! embraces the the absurd gaggle of elements in Billy Batson’s origin story — subway rides; wizards; a mixture of figures from Christianity, Judaism, and Greek mythology; a hero who wears a marching band cape — and succeeds by never spending a moment acting like anyone would consider them absurd at all. I would argue that it does this in an even more compelling way than Aquaman, despite the fact that Shazam! has to juxtapose its fantastical elements with downtown Philadelphia. And speaking of the rest of the DC Comics films, they’re not a prerequisite for Shazam! Rather than keeping the references to quippy one-liners, Gayden and Lemke have crafted a world in which their characters are fully aware of the shadows in which they stand. Freddy’s deep dives into superhero lore are part of why he urges Billy to be a hero, and Billy’s shallower understanding means he has some lessons to learn about not being a jerk. Almost the most obvious Interconnected Universe conventions in Shazam! are the inclusion of two post-credits scenes, which prove Sandberg has a larger world to carve out beyond the smaller-scale action of this first movie, if given the chance. Unlike many of its contemporaries, this film has a final stretch that melds humor, pacing, stakes, and real joy in a way that had me grinning like I would never stop. Yes, Shazam! is the holy grail of superhero adaptations when it pulls off an engagingly staged, thrilling, and emotional climax. But even more than that, the movie does right by my good son, Billy Batson, the big brother that every superhero-loving kid needs. Shazam! will be released April 5 in theaters.